JET RACK was invented in 2003 by two brothers who as Chicago area contractors together, ran into an extremely frustrating situation when their A-frame ladders stored on the top of their van were covered in a thick layer of ice one chilly night. Upon arriving to the work site, instead of starting work they found themselves chipping ice and wiping down very wet ladders before they could even consider entering a very nicely appointed home. They immediately questioned why they couldn’t have their ladders already stored inside as there seemed to be all sorts of room above their cargo which was piled high front to back and nearly reaching the top of the door line. This was the very moment that they realized that they could have avoided all of this trouble if only their most important ladders were stored above the cargo from the very start. Fast forward several months to the sweltering summer day they set aside to find their solution. They knew from past attempts to strap or hook their ladders to the ceiling that— if they were really going to do it right— there would have to be a much easier loading and unloading process and they imagined a sliding method would be ideal… but how? There, in the corner of the shop, were several pieces of Unistrut from projects past and the light bulbs went on, the pencil hit the paper, and welder burned bright. 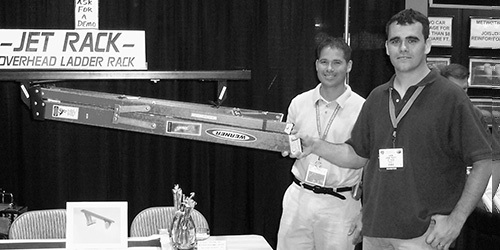 The JET Rack® ladder rack was created. They knew they had something special, and it was obviously a solution not only for themselves, but for thousands of others who have known this problem far too long. They wasted no time filing for patent and the first JET Rack sold in 2005. Along the way, competitors have failed to match JET Rack’s most affordable, most compact and most flexible design, making it far and away the leading choice among working people of all trades who today enjoy JET Rack® for the very same reason that it was invented in the first place- To Save Time, Save Space, and End Frustration.